For the 24th year running the Festival de Otoño returns to Madrid. A combination of music, theatre, dance and circus from around the world will entertain visitors and Madrileños for the coming 5 weeks. The event runs from the 15th October to the 18th November and is held is venues across the city. The Theatre companies who are represented include: Britain’s National Theatre, La Comédie-Française, Piccolo Teatro di Milano, Josep Maria Mestres. Dance companies attending include: Les Ballets C. de la B., Compañía Blanca Li, Toneelhuis. Sidi Larbi Cherkaoui and Compañía Carlotta Sagna. On the music front Caetano Veloso, Companyia Carles Santos, David Sylvian, Philip Glass and Compagnia dell’ Ambra will all be performing. 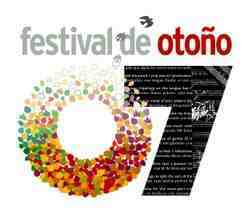 For more information, visit the Festival de Otoño website.